This bath was created with the Aero door style in Cherry finished in Slate. Standard slab drawer headers were used. Shown here on the Bayport door style in Maple. Peppercorn is a Tinted Varnish  nish. Shown here on the Hanover door style in Maple. Frost is a Tinted Varnish  nish. 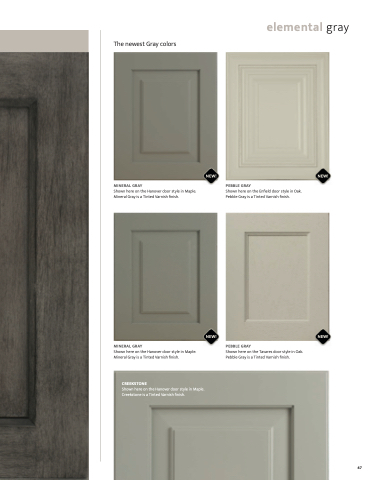 Shown here on the Gulfport door style in Lyptus. Slate with Ebony glaze is a Stain with Glaze  nish.